ICER is leading the way in developing Ecohydraulics as a transdisciplinary field. In 2016, the Director of ICER, Professor Paul Kemp, became Editor-in-Chief with Christos Katopodis for the new Journal of Ecohydraulics published by Taylor & Francis on behalf of the International Association for Hydro-Environment Engineering and Research (IAHR) and in association with the China Institute of Water Resources and Hydropower Research (IWHR). 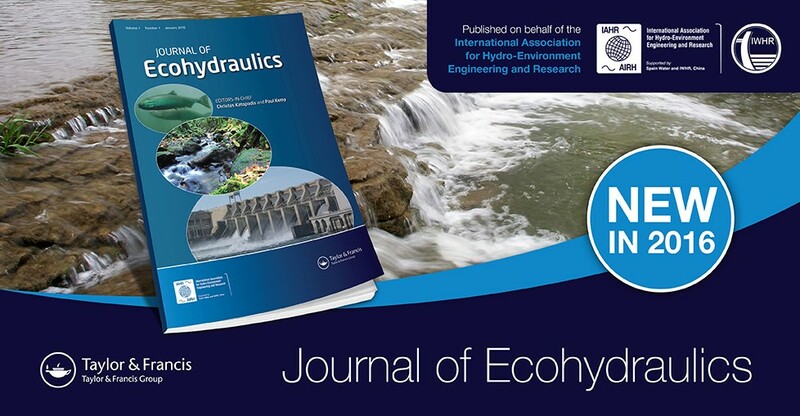 The journal embodies the varied research undertaken in ecohydraulics, covering water resources and aquatic life, ecology, biology, hydraulics, engineering, geoscience, environmental science, climate change, and other related fields, with an emphasis on the integration of these disciplines. This international journal is intended to highlight the diverse and varied research undertaken in the ecohydraulics arena spanning ecology, biology, hydraulics, engineering, geoscience, water resource management, environmental science and other related fields. The ethos of the Journal is that it should advance interdisciplinary research towards transdisciplinarity through the development of holistic, in-depth knowledge of fully integrated relevant disciplines. A range of approaches are involved, from physical and numerical modelling to empirical laboratory experimentation and field studies, aimed to answer fundamental questions and solve challenges of value to real world applications. Articles will demonstrate investigations and research interactions, bridging of disciplinary divides, as well as integration of physical and ecological processes. Ecohydraulics embraces the disciplines of fluid mechanics, hydrodynamics, morphodynamics, fluvial geomorphology, and hydrology; aquatic fauna behaviour, biomechanics, bioenergetics, and population dynamics; aquatic ecology and biology, from the individual to the population level, over a range of spatial (habitat patch to river basin) and temporal scales. Aquatic ecological and biological elements and modelling include individual species and communities, and range from riparian vegetation and instream algae, macrophytes, macroinvertebrates, fish, amphibians, reptiles to birds and mammals. Key ecohydraulic topics incorporate species-habitat relationships and biota movements in aquatic environments, ranging from freshwater riverine to estuarine, marine and lentic ecosystems, including interactions with groundwater; e-flows, i.e. environmental, instream or ecological flows, including interactions of ice and thermal regimes, water quality, and floodplain or channel with ecology; mitigation measures, such as biota passageways, fishways, fish screens, habitat improvement or replacement; river basin, ecosystem, estuarine, delta, and wetland restoration, including removal of dams and other water infrastructure; environmental impact assessment and aquatic ecosystems assessment; and the development of methods and approaches used. The journal will be read and contributed to by aquatic biologists and ecologists, environmental scientists, civil and environmental engineers, regulators and policy makers, natural resource managers, and conservationists. The journal will be of interest to academics involved in fundamental or applied science, as well as practitioners working at the applied environmental management end of the spectrum, including those who seek innovative solutions to environmental impacts of existing or new projects. The journal welcomes full papers, short communications, comments, letters to the Editor, and review articles after discussion with the two Co-Editors. All submitted manuscripts are subject to initial appraisal by the Editors, and, if found suitable for further consideration, to single blind peer review by at least two independent, anonymous expert referees.